When it's done right, meat is the most powerful protein on the planet. 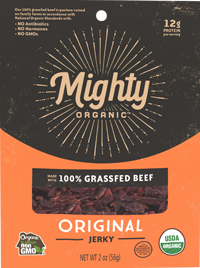 That means our jerky, bars and sticks are made with certified organic, humanely-raised, grass-fed beef and free-range chicken. No antibiotics. No artificial hormones. No GMOs. No nitrates, nitrites or other chemical nonsense. Most meat snacks are sketchy gas station Frankensnacks full of mystery meat, artificial flavorings and chemical preservatives. And many claiming to be better aren’t even organic, they’re just good at acting fancy. Mighty is different, because it’s what’s on the inside that counts. Everything inside is USDA Certified Organic, meaning our meat is raised without antibiotics, growth hormones, toxic pesticides or GMOs. Our cows eat as nature intended: munching grass all day, every day. And when we say grass, what we really mean is over 250 species of native grasses our cows get to choose from. This means happier, healthier animals and healthier, more flavorful meat. Grass-fed beef tastes more like, well, beef, and it has more omega-3 and other healthy fats than beef raised primarily on corn and other grains. Chickens weren't born to live in cages (or, for that matter, to take antibiotics and eat genetically modified feed). We go above and beyond organic standards to guarantee that our chickens have ample room to roam, plenty of perch and scratch room and extra shade to chill in when they're outside. Because a happy, healthy chicken is a mighty chicken. Cows evolved to spend their days eating grass out in the sunshine, so that's what we let them do. Our cows are completely free roaming, spending their entire lives moving freely around 17 million acres in the heartland of Australia. Conventional chickens are overbred, overfed and underexercised so that they'll fatten up faster while being crowded together 24/7 in windowless sheds. In contrast, our chickens eat organically, get tons of exercise and fresh air, and live long, happy lives as laying hens. We only use prime cuts of organic meat and whole food ingredients like nuts, fruit, and seeds. We spend almost as much time crafting our recipes as we do sourcing from the best organic growers, and exploring potent new taste combinations. Because what good is a meat snack if it doesn't snack you in the face with flavor?